Yes, you can find legal monopolies offering 10%-plus dividend growth. Here are two to get you started. The government doesn't like monopolies, but it realizes they are necessary in certain instances. For those businesses where a monopoly is desirable, the government usually steps in with heavy regulation. 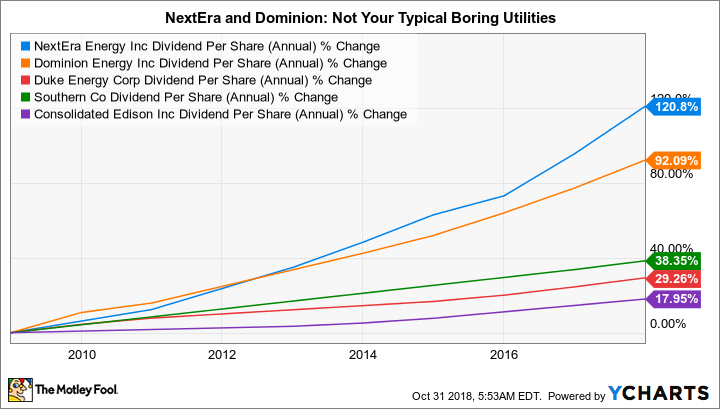 That is basically what goes on in the utility space, effectively ensuring that companies like NextEra Energy, Inc. (NYSE:NEE) and Dominion Energy, Inc. (NYSE:D) operate in protected markets. The trade-off for such monopolies is usually slow growth, but not for this pair, which are offering investors double-digit dividend growth today. NextEra is really two companies in one. The foundation of the business is its regulated utility, Florida Power & Light, which is the largest electric utility in the state of Florida. It also happens to be one of the largest utilities in the country. Off of that base, NextEra has been building a renewable power business known as NextEra Energy Resources. This business is one of the largest wind and solar companies in the world, with renewable power assets backed by long-term contracts. Overall it's a pretty stable business. The company has an investment-grade credit rating, and between 2005 and 2017 has grown earnings at roughly 8% annually. Over that span, dividends have grown nearly 9% a year. The plan to continue that growth includes capital spending of as much as $44 billion. As much as $19 billion will go toward the regulated side, which is what gets regulators to approve rate hikes. The rest is earmarked for building and acquiring fee-based assets on the renewable power side, which increase cash flow once built. The utility's payout ratio, meanwhile, is modest, hovering around 40% in 2017. Allowing the payout ratio to inch higher, in turn, will allow the company's projected earnings growth of 6% to 8% a year through 2021 to support dividend growth of as much as 14% a year through 2020. With a solid regulated monopoly underpinning the company's business, investors looking for swift dividend growth should take a close look. That said, the 2.5% yield here is toward the low end of the industry, which makes sense given the growth prospects but suggests that it's not the best option for income-focused investors. Dominion Energy is one of the largest utilities in the United States. It owns electric and natural gas utilities, midstream and energy transmission assets, and a merchant renewable power business. The company serves nearly 6 million customers across 19 states, with around 90% of its business regulated or driven by fee-based assets. While that sounds like a very stable business -- and it is -- the yield is currently toward the high end of the utility sector at around 4.5%. The reason for that is two-fold. First, Dominion is trying to acquire SCANA Corp., a smaller and financially troubled utility. It's a complex situation, involving SCANA's decision to scuttle a partially completed nuclear power construction project. The reception to the deal has been chilly, at best, and it may not get done. And while buying SCANA would expand Dominion's reach in high-growth states, it would be taking on the company's nuclear troubles -- kind of a mixed blessing. The second reason for the above-average yield is that Dominion had been planning to use a controlled limited partnership, Dominion Energy Midstream Partners, LP (NYSE:DM), to help fund its roughly $3 billion to $4 billion annual capital investment plans through 2021. That hasn't worked out as planned, leading to a material shift in the funding plan. Dominion is now selling assets and taking on additional leverage at projects that it had intended to sell to its controlled partnership. In addition, it is acquiring the partnership because selling, or dropping down in industry lingo, assets to the partnership is no longer a viable funding option. When you step back, there are a lot of moving parts at Dominion today. However, the company has an investment-grade credit rating and hasn't backed away from its projection of 6% to 8% earnings growth through 2020 (with 5% growth thereafter). That, in turn, is expected to back dividend growth of as much as 10% a year. The payout ratio is high right now, in the mid-80% range, but management says it is comfortable with that and expects it to fall once the current round of investments starts to add to cash flow. Despite having to adjust with changing circumstances, management has been executing well overall. For investors willing to pay closer attention to what they own, Dominion looks like a high-yield utility worth a deep dive today. Investors often assume the utility space is filled with boring, slow-growth companies. That's the normal trade-off for having a government-protected business. But you can't paint every utility with the same brush. NextEra has a well-located, regulated business that it's using to expand a fast-growing and world-leading renewable power operation. Dividend growth investors should take a closer look. Dominion is investing heavily in its business right now, with a lot of moving parts, but has been living up to its financial goals despite some notable headwinds. Investors willing to monitor their holdings closely should get to know this industry giant a little better if they are looking for a mix of high yield and robust dividend growth.